Safely and effectively clean tough dirt and grime from various areas! All natural and safe on leather, plastic, paint, etc. The 3D Orange Degreaser is an all-natural cleaner designed to safely target tough dirt and grime on your carpets, mats, interior trim, dashboard, doors, paint, exterior trim, wheel wells, tires and so much more! Sometimes dirt and grime need a little more cleaning power than just a normal cleaner. However, just because you need a stronger cleaner that doesn't mean that it has to be unsafe. The 3D Orange Degreaser utilizes an all-natural and organic citrus oil "D-limonene" that is effective yet gentle. This unique formula helps remove tough stains, grease, oil, dirt, and odors and more. The strong cleaner is all natural and safe on various surfaces inside and outside your vehicle, so it's very versatile. While you can use this product as is, 3D recommends diluting at 1:10 (orange degreaser: water) for light cleaning (leather, plastic, and vinyl) or dilute at 1:4 for pre-treating tough stains. 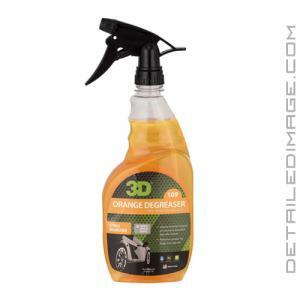 Versatile, safe and effective, add the 3D Orange Degreaser to your detailing collection today! How to clean with Orange Degreaser. Removes dirt, grease, tar, bugs, tree sap, etc. To clean carpets and fabric seats, lightly spray Orange Degreaser on the surface and clean with a brush. Remove with a wet-dry vacuum or clean damp microfiber towel - Not directly on the surface and wipe dirt or grease from the surface. Be sure to completely remove Orange Degreaser from all surfaces with a damp microfiber towel to remove all the Orange Degreaser. Then wipe the surface with a clean dry cloth. It is overpriced and does not do what it claims to do such as remove tar.